I used the Bezier Spline Drawing Tool on Front View Mode (Not Perspective View). I sketched out half a glass, starting with the base of the cup at XY 0. It was quite hard to perfect, but luckily the points could be repositioned with the Move Tool. Then I selected the Lathe NURB Object, and in the Object Manager I placed the Spline into the Lathe NURB, this changed the 2D Spline in a 3D Object. Next I added a Floor Object from the Scene Menu, and repositoned the Glass above the Floor Object with the Move Tool. 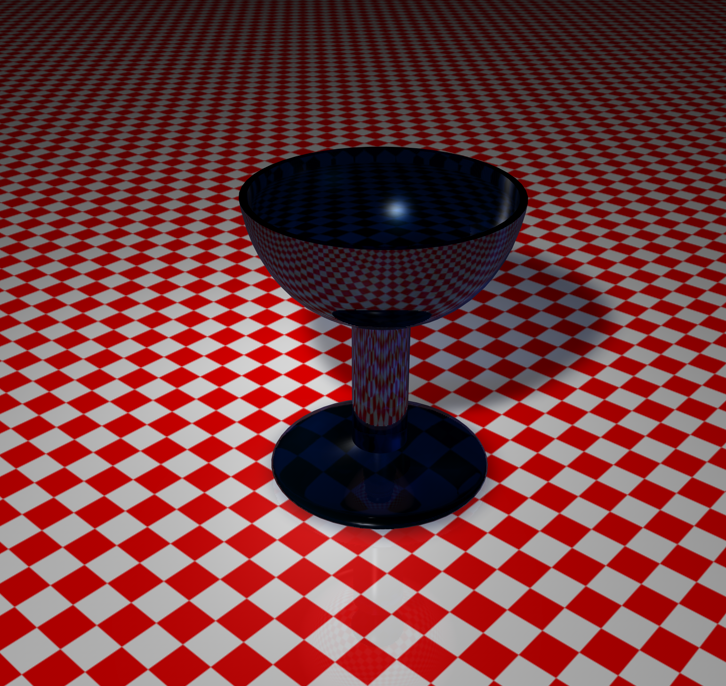 To make the glass appear smoother when rendered I increased the Lathe NURB Subdivisions (number of Polygons its made from) to 50 (in the Attributes Manager). To make the Glass Material I deselected Colour Setting and selected Transparency Setting where I applied a Colour, 50% Brightness and 1.5 Refraction. I also selected the Reflection Setting and applied a 25% Brightness. And Specular Setting with a Plastic Mode and Width of 27%. 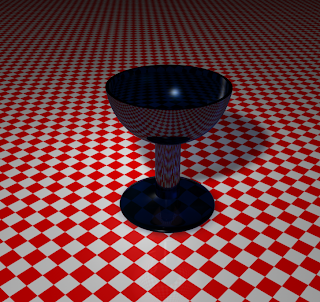 I added this material to the Glass Object and a Checkerboard Material to the Floor Object. To finish I added 2 Omni Light Objects with a 50% Brightness and Soft Shadows instead of one light with 150% Brightness as it caused too much dark shadows.